3.3 feet SUPER SLIM 8 Pin Lightning Extension Cable / Male to Female Extender Cord for iPhone / iPad [POD005888] : Onchee.com - the accessory shop for all your handheld Electronics! This lightning extender can let you hold your iphone/ipad in your hand or before you with long extension from adapters, cars, audio dock, thick cases and so on. - SUPER SLIM: Specially designed to be used as an extender, so the MALE END SIZE is .... which make sure your devices has enough space to connect this cable. - If for charging, please make sure your power adapter output is over 2.4 or it may charge slowly or even disconnect. - Please use verified charging cable. 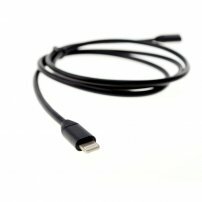 This is not an MFI cable, it may prompt up “not supported by iPhone” or “not certified accessory” issues but it will not affect normal use of this cable.